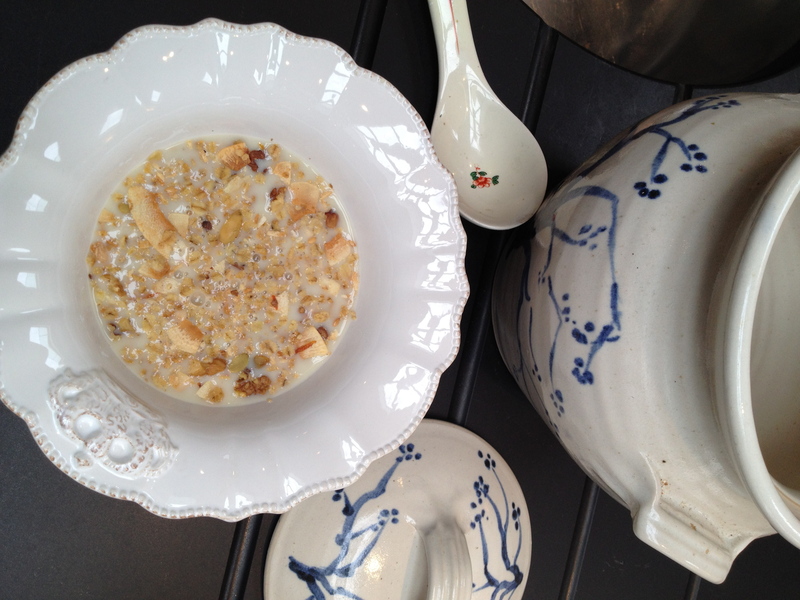 Granola is a relatively new comer on the food scene- I don’t recall eating anything like that when I was younger. But it is a very worthy addition to a health-conscious larder and even though there are some delicious shop-bought versions, it remains a luxury product. Given it is such an easy thing to make in big quantities, I would really recommend you try doing your own customised version from time to time. Mix all the dry ingredients into a large bowl, then add the oil and mix it in. Add the maple syrup and rub it all in. 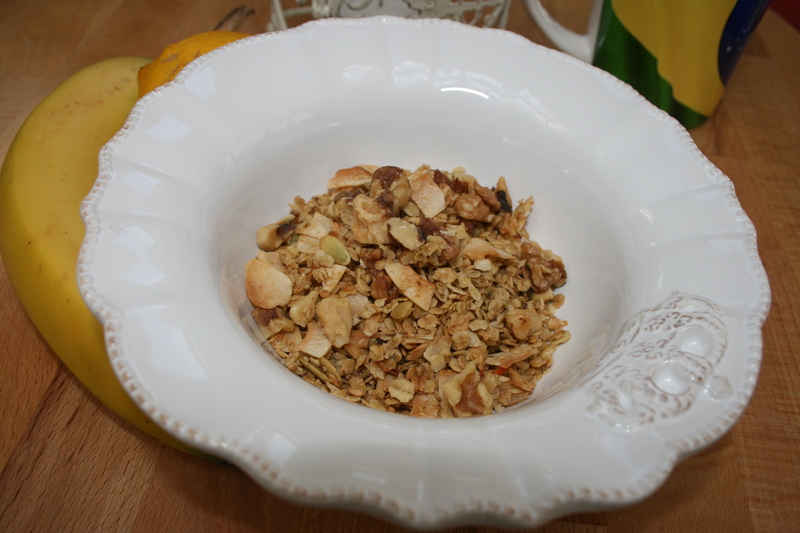 This time I used some toasted coconut shavings that I had found at Wholefoods and they were a great addition! But if I don’t have them I’ll try something else! I love experimenting with new flavours and the hint of citrus brought in by the zest makes my morning every day at the moment! Aromatherapy tells us that lemon and orange essential oils are both uplifting and energising so I feel this is therapy as well as a meal. Spread the mix into a shallow dish and place in the middle shelf of your oven for no more than 40 min at 150°. Slowly baking is best. It is ready when toasted and golden. A low oven is important because the seeds burn easily. 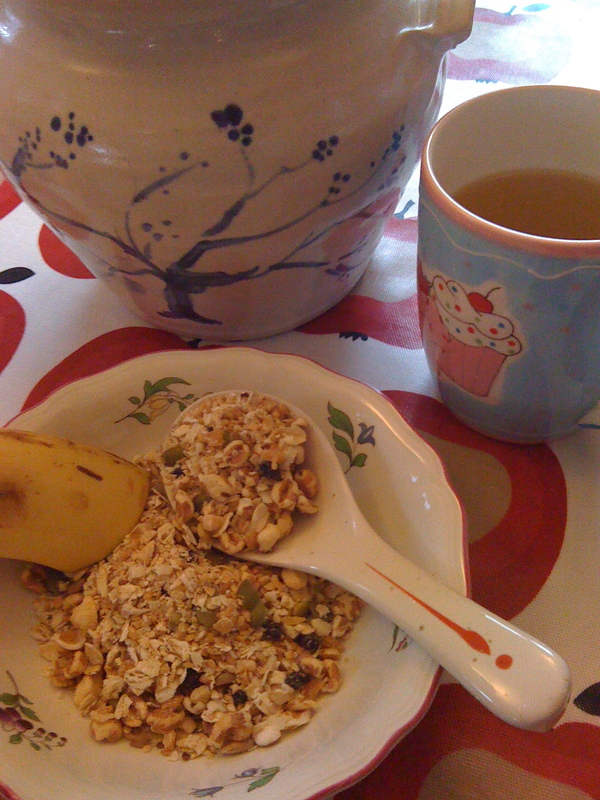 This entry was posted in family favourite, pot luck, spring and tagged granola, health, lemon, macrobiotic, oats, spring, vegetarian, Wholefoods. Bookmark the permalink. Mmmmh! definitely going to give this a go after stocking up my larder at the local bio store next weekend – here comes the spring!